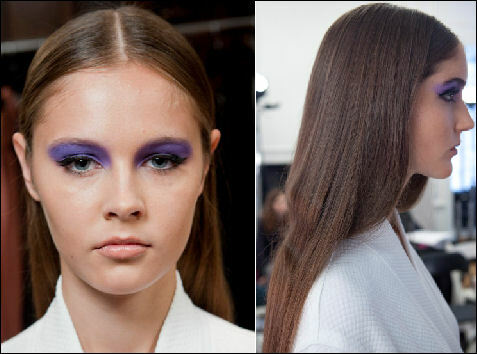 Check out the hair and nail trends at the Spring 2011 shows at New York Fashion Week. She first applied the original Moroccanoil Treatment from roots to ends (using Moroccanoil Light for hair that was fine and blonde). She combed or brushed (depending upon texture) the hair completely flat, created a deep part on the left side, pulled it back and sprayed Moroccanoil Luminous Hairspray to hold it in place while she continued styling. The hair on the right side was released into a rounded shape, almost Twiggy-style, and then sprayed with Moroccanoil Luminous Hairspray. Hair on the left side was then pulled back into a ponytail with a thin hair band. Strands on the rounded right side were wrapped around the top of the ponytail, pinned, then released to blend and flow down the back. After shaping the hair, Gilbert then clipped a rectangular silver-colored hair accessory to attach the length of hair to the nape of the neck and keep it from moving. She finished with Moroccanoil Luminous Hairspray to hold the look in place. She finished with a light misting of Moroccanoil Glimmer Shine Spray all over the hair for long-lasting shine and to prevent static or frizz. Gilbert first blow dried hair straight using Moroccanoil Treatment or Moroccanoil Light (for fine or light colored hair) to protect and prepare the hair for smoothing with a flat iron. After creating a deep side part, she lightly moistened top of hair from forehead back to crown and applied Moroccanoil Hydrating Styling Cream and separated hair a bit with fingers. She then sprayed Moroccanoil Luminous Hairspray only several inches away from the hair and further separated strands with a comb for a striated tropical effect. She blow-dried the shaped texture, and sprayed a final light misting of Moroccanoil Luminous Hairspray from a distance to hold the look. Gilbert then brushed the rest of the hair, from back of crown to the ends, letting it fall naturally, and then tucked the hair behind the ears. At the Carolina Herrera show, Orlando Pita created unique, intricate looks with bold graphic details inspired by Korean design. “When Korean women dress, nothing is out of place and everything is beautifully thought out,” Pita said. “My hairstyle is precise and graphic, with no loose or separate pieces. Pita used Moroccanoil Light throughout dry hair to create a healthy looking frizz-free shine, and smooth, healthy-look ends. He then applied Moroccanoil Hydrating Styling Cream midway from the back of hair to the ends, and then blow dried the hair smooth and straight with a round brush. 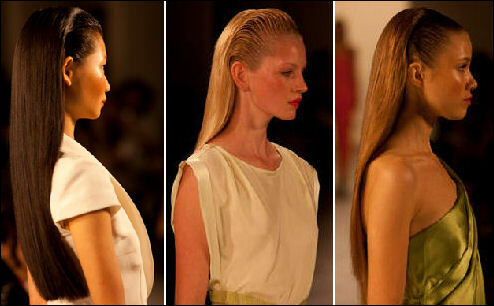 He created a deep side part, pulled hair back, and sprayed it with Moroccanoil Luminous Hairspray. Pita combed the hair again with a wide tooth comb, sprayed with Moroccanoil Luminous Hairspray and pulled right side of hair diagonally over left, and pinned the hair above the nape of the neck with a creative cluster of custom made “Hair-Barrettes” that matched the color of model’s hair. These were pinned either horizontally or vertically to create dramatic graphic patterns. The finished looks were sprayed once again with Moroccanoil Luminous Hairspray for added hold, and finished with a misting of Moroccanoil Glimmer Shine Spray. 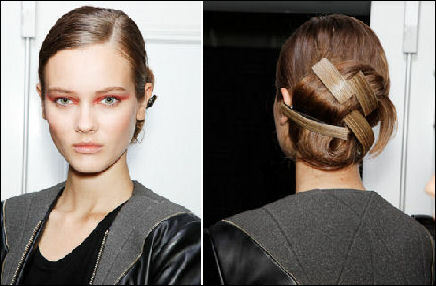 Pita created two variations of the style, an updo as well as a longer pony-tailed effect. For the longer look, he combed the hair into a ponytail, sprayed once again with Moroccanoil Luminous Hairspray, and added additional horizontal hair-clips to accent the graphic effect. To create the dramatic chignon, he took finished ponytails, looped them around, and pinned with diagonal, horizontal, and vertical hair clips, and then finished with Moroccanoil Glimmer Shine Spray. “The curls are tight and combed through into a wave at the front, looser at the crown, with progressively smaller curls as they reach the back of the head,” Peter Gray said about the models at the Badgley Mischka show. “They’re designed to tease the eye and keep it moving, almost in the same way as when the fabrics flow and fall as the models walk. Gray used different sizes of curling irons to create varying types of curls, textures and volume. He created smaller curls at the base of the look to push up and support volume on top layers of curls. He then used progressively larger curling irons for wavier curls as he reached the crown as well as the front sections around the face. Gray took small square sections of the hair at the nape of the neck (the same size as the diameter of the small curling iron he used.) This creates volume-enhancing tighter base curls. He then applied a small amount of Moroccanoil Hydrating Styling Cream on each section, layered on a light spritz of Moroccanoil Luminous Hairspray and wrapped sections around the curling iron. As he made his way up the hair, Gray graduated to vertical hair sections the same size as the diameter of the larger curling iron he selected, taking bigger sections as he reached the crown. Working primarily towards a side-part creating a wave in the fringe, he took small horizontal sections and worked back with the curling iron, starting at the hairline and completing at the crown. Curls were held in place by lightweight aluminum clips to ensure springiness. After combing out the curls, he applied a light mist of Moroccanoil Luminous Hairspray over the entire look to hold it in place, while keeping the hair soft, flexible, and natural-looking. Renato Campora, lead stylist for Frédéric Fekkai, created a modernized rockabilly style for this season’s Marchesa presentation. He applied the Fekkai Essential Shea Tame & Style Pot de Crème to the hair. Then, he flipped the head over and braided the hair out, which allowed it to fall perfectly on top of the head. Next, Campora secured the braid into a bun at the crown. He smoothed the hair using the Fekkai Essential Shea Ultra-Rich Mask and applied Fekkai Silky Straight Smooth Finish for protection and shine. Finally, for a richer and rougher style, Campora placed an embellished accessory designed by Marchesa to the finished look. Paul Hanlon, lead stylist for Frédéric Fekkai, created a rough, tousled half-twist with volume and wave for Proenza Schouler‘s runway show. He first applied Fekkai’s Coiff Oceanique Tousled Wave Spray heavily throughout the hair from roots to ends to create texture and fullness. He then used a diffuser while finger combing the hair dry. Hanlon then loosely gathered and tucked the top half of the hair into a french twist at the nape of the neck, leaving a few long layers of hair free. To obtain the modern style, he left the ends out of the twist and sprayed Fekkai Coiff Sheer Hold Hairspray all over to secure the look. 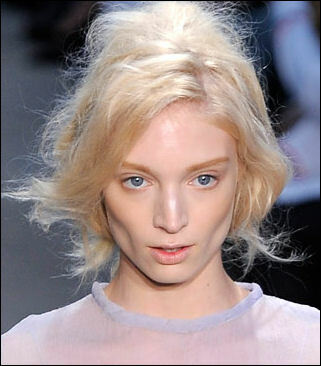 Didier Malige, Frédéric Fekkai’s lead stylist, was inspired to find the beauty in each model and created a light and tousled look with shape, for Thakoon‘s Spring 2011 show. First, he used the Fekkai Coiff Bouffant Lifting & Texturizing Spray Gel at the roots, combing it back with his fingers, away from the face. He then applied Fekkai Coiff Oceanique Tousled Wave Spray to the middle and ends of the hair. Didier completed the look by teasing the back of the hair to keep it light and create shape. Malige also styled the models at the Victoria Beckham show, where he was inspired by hairstyles of the 60’s, but without the tease. He first prepped dry hair with Fekkai Advanced Full Volume Styling Whip to give hair slick volume. Next, he created a middle part and tucked the hair straight behind the ears and spritzed with Fekkai Sheer Hold Spray to make the hair more straight and heavy. Malige finished the look by using a waiving tool to make an unexpected single crimp across the back of the hair. The result was a modern take on a mod era. At Cushnie et Ochs, the nails looked like they had been dipped in gold to complement the flowing feel of the clothes. They were painted with a basic clear base coat and then a gold foil was applied by rubbing it straight onto the nail. Ashleigh Verrier went with a pastel mix of Pier 39 polish, a cool minty pastel green, mixed with a touch of white polish to make it lighter. The results were refreshing on the runway! The polish accented the mono-chromatic collection. Pattie Yankee and her team applied the silver metallic No More Alimony polish to the models’ nails at Farah Angsana. At the J.Mendel show, Yankee applied Charlotte’s Wedding to the models for a beautiful sheer white. Yankee created press-on nails for female models at the Jose Duran show using The Met, a white polish for a base, and Limo Service, a black polish to create a Chevron French. Male models were also given a similar manicure as well as pedicures to emulate the androgynous tone. Fun and funky, Rosa Cha‘s bright and bold swimwear print coordinated perfectly with the new Spring 2011 Dashing Diva polish, East Side Envy. At Yoana Baraschi, Yankee used East River View for a feminine polished look for hands. For toes, Pattie kept with Yoana’s vision of a fierce and free-spirited woman by using Bittersweet, a deep chocolate brown, and New York Slice, a bright coral pink.